Founded in 2008, Branding Brand is an m-commerce platform and technology provider that develops applications and websites for enterprise retailers. The Pittsburgh-based company has the most clients among the top 1,000 e-retailers such as Kate Spade, American Eagle Outfitters, Costco, Calvin Klein, and dozens of others. 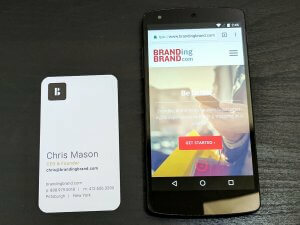 The Branding Brand team is using bigDAWGS’ NFC Business Card as their official personal business card. Just by simply tapping an NFC-enabled mobile device, Branding Brand’s website will automatically run and open on your device. For a unique custom business card that best represents your line of business, visit bigdawgspromo.com now!